I feel like I am discovering lots of new brands lately. 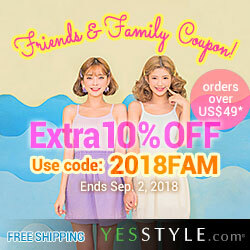 More and more Asian beauty brands are expanding to the west, making discovering them a lot easier. 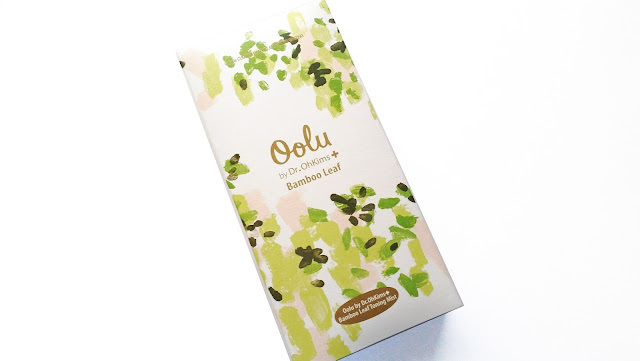 Today I want to share with you guys my review of this Oolu Bamboo Leaf Toning Mist. 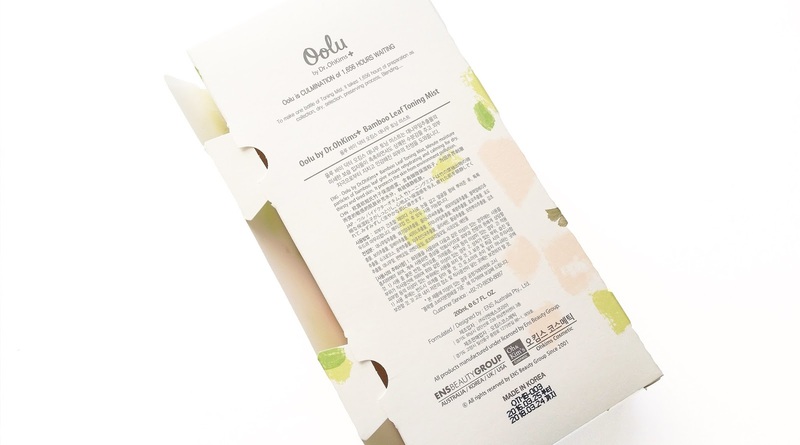 Oolu is a skincare brand that focuses on using natural ingredients. Their products are eco-certified as well. Let's get to know it! Product Description: The Oolu Bamboo Leaf Toning Mist is a facial mist that can refresh and relax dry and sensitive skin. 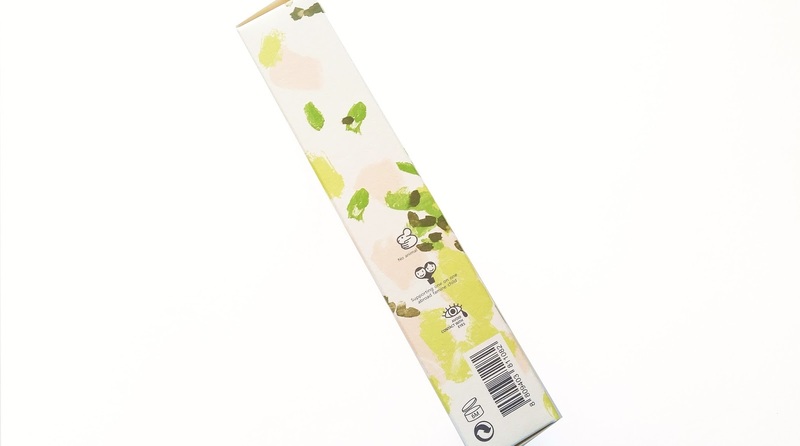 It is certified by France's Ecocert and Germany's BDIH as a pure eco-cosmetic. This antioxidant packed toning mist contains organic bamboo leaf and various nutritious extracts. It has anti-inflammatory and anti-bacterial properties. The mist can also help to regulate pH balance, control excess sebum, and provide moisture to the skin.This toning mist can also calm tired skin and protect it from environmental damages. To Use: Close your eyes and spray the mist onto your face and neck. Use this mist whenever needed and reapply when needed. Ingredients: Bambusa Vulgaris Leaf Extract, Arabidopsis Thaliana Extract, Cola Acuminata Seed Extract, Chamomilla Recutita (Matricaria) Flower Extract, Morus Nigra Fruit Extract, Hordeum Distichon (Barley) Extract, Triticum Vulgare (Wheat) Germ Extract, Jania Rubens Extract, Betula Alba Leaf Extract, Poria Cocos Extract, Yeast Extract, Vitis Vinifera (Grape) Fruit Extract, Sucrose, Glycine Soja (Soybean) Sprout Extract, Echinacea Purpurea Extract, Glycerin, Scutellaria Baicalensis Root Extract, Paeonia Suffruticosa Root Extract, Glycyrrhiza Glabra (Licorice) Root Extract, Bambusa Vulgaris Leaf, Chamaecyparis Obtusa Oil, Lavandula Angustifolia (Lavender) Oil, Rosmarinus Officinalis (Rosemary) Leaf Oil, Pyrus Malus (Apple) Oil, Alcohol. Packaging: The Bamboo Leaf Toning Mist comes in a really pretty box packaging. It opens like a book and inside there is a storage space for the mist bottle. The design reminds me of those hollow books, which is really neat! The mist also comes wrapped in a thin layer of tissue paper with an Oolu sticker on top. Toning mists do not usually give off a luxury feel but this one does. 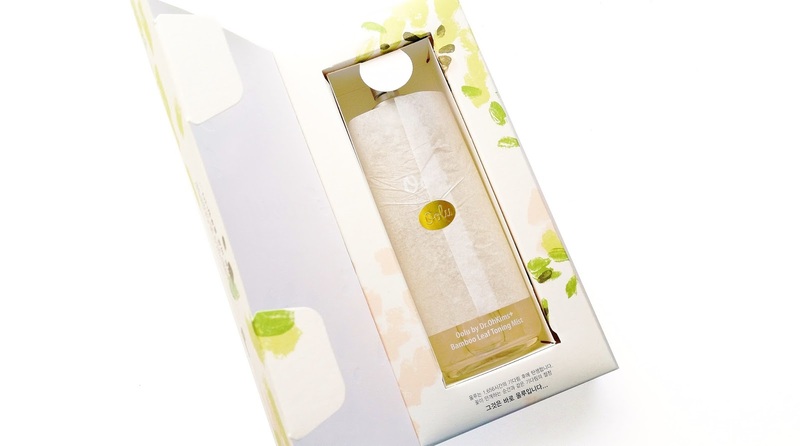 When you unwrap the tissue paper, you will see the toning mist is stored in a clear bottle with a spray top. The product does not come with a lid, however, it does have a stopper which can be inserted onto the spray part to stop the spray action. Both the bottle and the box have product information printed on. Although, it is easier to see on the box than it is on the bottle. One neat thing about this toning mist is that there are actually bamboo leaves inside the bottle. You can see it in the image below. Scent: This toning mist has a mix of scents. It smells kind of like herbal essential oils but not quite completely either. Texture: The toning mist is liquidy like water, however, it does have a slight oily feel to it as well. Most likely due to its herbal oil ingredients. Helen's Thoughts: I think one of the hit or misses for many people will be this toning mist's scent. Personally, I like it because it smells like an essential oil that I like a lot. It has that herbal scent that is relaxing and makes me feel like I am at the spa. While the scent is not overwhelming, it is strong. So, it might not be suitable for those sensitive to scents. When it comes to mists, I prefer fine mists over ones that spray large droplets. I think that is the case for many people as well. So this Oolu Bamboo Leaf Toning Mist disappointed me a little because its spray top does not spray a fine mist. Which is one of the reasons why I do not use it like a mist. Instead, I use it as a toner. By spraying the product onto my hands first than patting it on. This toning mist is hydrating and contains a lot of nourishing ingredients. It feels lightweight on the skin and its watery formula is easy to absorb. 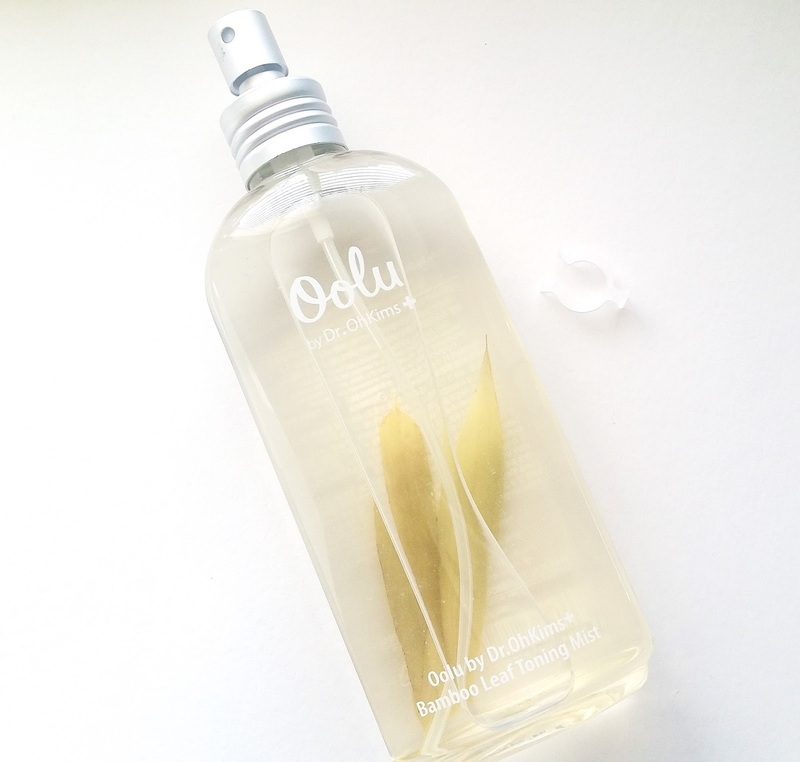 The Oolu Toning Mist also feels refreshing and calming when applied as well. -alcohol is an ingredient, please be careful if you are sensitive to it. Final Thoughts: This product turned out to work better as a toner than a mist. It could have just been the bottle I got that has a bad spray top but I did not experience a fine mist with it. Instead, it was more like a squirt of large water droplets. So far it seems like a simple toning mist that does the basic hydration and nourishing needs but nothing too special. Unless you count its packaging, which looks really pretty. I do like the formula that is lightweight and easy to absorb. Would I purchase it in the future? Currently undecided. Since the spray top on my toning mist does not work well, I have been using it as a toner instead. While it works, I still wish the spray top sprayed a fine mist. I worry that if I repurchase it, my next bottle would have a bad spray top too. Do I think this is worth a try? If you came here looking for a mist with a fine spray top, you are in the wrong place. There is no guarantee that is what you will get since I got one that spray droplets instead. However, if you came to check this product out due to its nourishing ingredients and easy to absorb formula than do give the product a try. 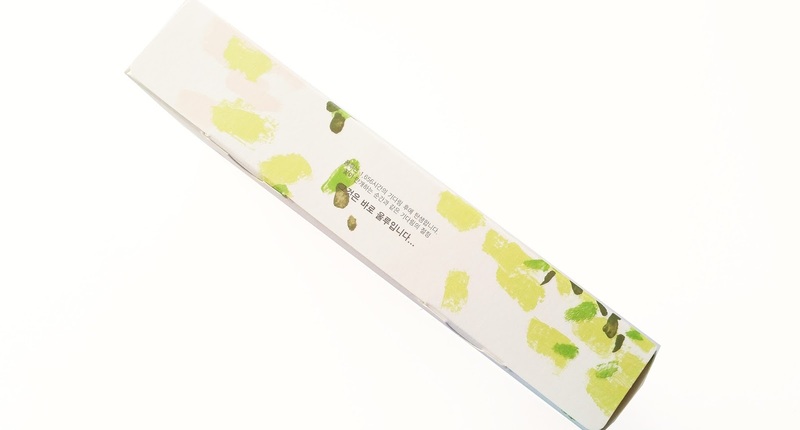 It still works well as a toner and with its abundance of natural ingredients, it will surely do the skin some good. Disclaimer: This product was sent to me for review purposes. All opinions are honest and my own. For more information check out the full disclaimer.